What Can Gardeners do to Help Honey Bees? Most people have heard about the decline in honey bees (Figures 1 and 2) during the last several years. Are there things home gardeners can do to help? Figure 1. Honey bee on tidytips. The actual cause of the decline is still uncer­tain. What is known is a number of factors are probably involved. Honey bees are their most robust and able to best contend with stresses when well fed. In addition to water, honey bees require nectar sources for car­bohydrates and a varied mix of pollens to provide proteins, lipids, vitamins, minerals, sterols, antioxidants, and other nutrients. Drought, flooding, and conversion of for­mer foraging grounds into large agricultural monocultures, highways, airports, develop­ments, and so forth have led to honey bee malnutrition in many locations. In the last 20 years beekeepers have been en­countering a series of previously exotic pests that invade the hive and kill bees, such as the varroa mite; new honey bee diseases, includ­ing Nosema ceranae; and many viruses. Figure 2. 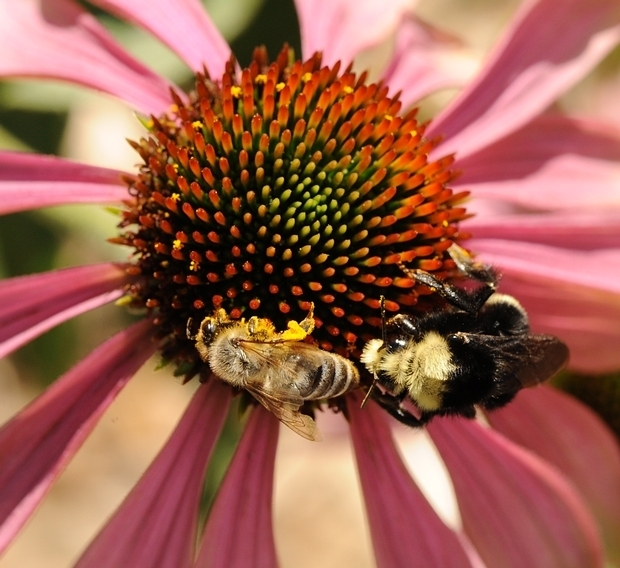 Honey bee and yellow-faced bumble bee on cone flower. Pesticides can also be involved in bee decline, especially when applied to plants when they are in bloom and bees are for­aging. Many insecticides are highly toxic to bees including virtually all organophos­phates, carbamates, and pyrethroids. If not killed in the field, foraging bees can collect residue-contaminated pollens and bring them back to the hive for immediate consumption or long-term storage. There are serious concerns over the chronic, sublethal effects of these residues on the physiology of immature and adult bees. A newer class of insecticides, the neo­nicotinoids, which include imidacloprid, clothianidin, and dinotefuran, also pose hazards for honey bees. These products are systemic materials that move through the plant and are included in the nectar and pollen of flowers when they bloom. Although the neonicotinoid residues may not kill bees immediately, they may have sublethal effects, such as suppressing im­mune and detoxification systems, causing bees to be more sensitive to other stresses. There are several ways gardeners can help protect bees. When customers design or replant a landscape, suggest they consider honey bees and other pollinators in their plan. Help customers find plants honey bees prefer, and suggest how to ensure sev­eral bee-friendly plants will be blooming throughout the year (Figure 3). For lists of California native plants bees visit, see http://beebiology.ucdavis.edu/HONEYBEES/floralvisits.html or the UC Urban Bee Gar­dens page at http://www.cnr.berkeley.edu/urbanbeegardens. Also, if bees are still visit­ing certain flowers, delay removing spent flowers until bee visits taper off, even if the results aren't as aesthetically pleasing. In addition, advise customers against apply­ing highly toxic insecticides, especially when plants are in bloom. With neonicotinoids, also avoid applying them before plants bloom, because these materials tend to be stable compounds that can remain in the soil and in plants for months. Even when plants aren't in bloom, use nonchemical manage­ment methods or pesticides with little or low toxicity to bees such as soaps, oils, or Bacillus thuringiensis whenever possible, as pesticides may leave toxic residues, or there may be flowering weeds or other blooms nearby. 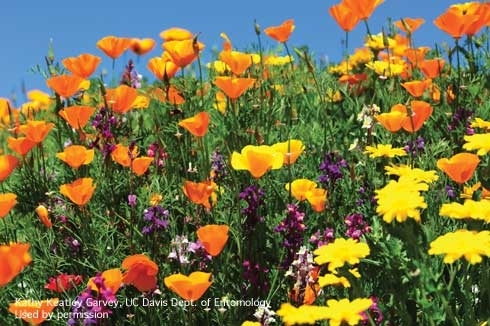 For information about the relative toxicity of pesticides to bees, consult How to Reduce Bee Poisoning from Pesticides at http://www.ipm.ucdavis.edu/PDF/PMG/pnw591.pdf. 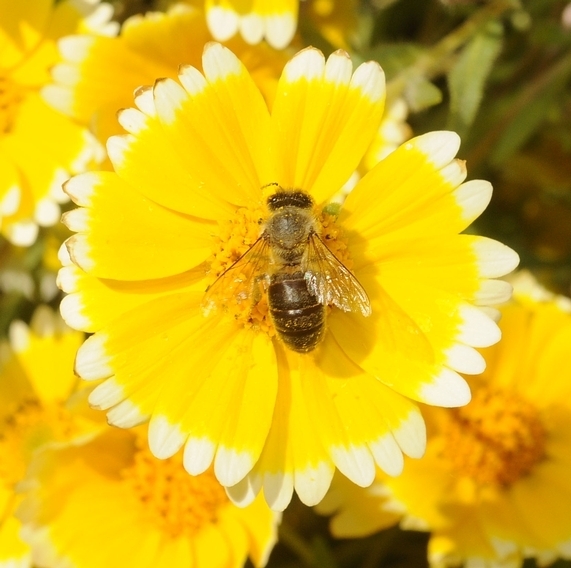 Toxicity of many landscape and garden pesticides to bees is also listed in the UC IPM landscape and garden pesticide active ingredient database at http://www.ipm.ucdavis.edu/PMG/menu.pesticides.php. Figure 3. Nectar and pollen-producing plants in full bloom. This article was originally published in the June 2013 issue of the UC IPM Retail Nursery & Garden Center IPM News. See this and other articles at http://www.ipm.ucdavis.edu/RETAIL/retail-newsletter.html.